After feeling abandoned as a child when her mother left to elope with a Spanish lover, and a failed love-affair in her early twenties, Georgie has hardened her heart to love. At least, that’s what she thought. Friendship is fine. She’s been friends with Julian for years. He has always had her back, hasn’t he? When she hears beautiful, strange music playing in a pub one night, she goes to seek out the musician and finds Nikolai, a Russian, whose smooth tongue and rugged good looks intrigue her. But should she trust this ex-soldier, labouring cash in hand? What has he run away from? On the one hand are the business savvy and rich – Julian and her father – on the other are the outsiders, the artists with questionable mental stability – Nikolai and her mother. Of course nothing is black and white, but it is all too easy to have a blind side, especially in a London thrown by the 7/7 bombings in 2005. 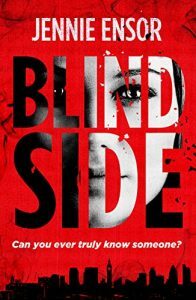 Blind Side encourages us to question our stereotypes, to face our instinctive fears and to try to truly live while we can. It’s also a page-turning love story. I enjoyed reading the novel. It is well crafted and Nikolai’s Russian accent sounds beautifully in my mind. The parts that show Nikolai’s past in the Chechnyan war are carefully handled and provide an interesting counterpoint to the London terror attacks. I would, perhaps, have liked to feel more involved in the characters’ lives. Despite all the craft and careful plotting, the well-described sexual encounters, I never quite felt the pain of their emotional blows. This, however, is undoubtedly simply a matter of personal taste. It would be hard to read the novel and not feel gripped by the narrative. Next week I’m reading Everything you do is wrong by Amanda Coe. thanks for your review Rebekah!